You are here: Home / News / Who you gonna call? Have you heard of the Ombudsman? 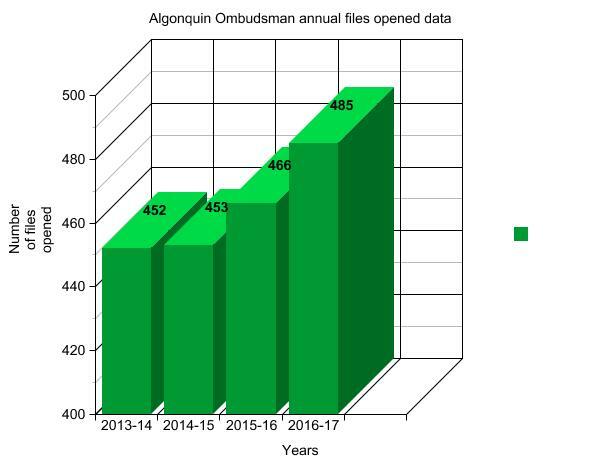 This graph shows the how many files were opened year over year with the Algonquin Ombudsman's office. The data is available in the office's annual report. Who you gonna call? Have you heard of the Ombudsman? With more students than ever attending Algonquin, it’s inevitable there will be an increase in disputes. And with the maze of procedures, positions and offices throughout campuses, finding the right place to solve them can be a big challenge. Enter the office of the Ombudsman — a tool students can use to resolve their respective issues or have their complaints heard. The office is the final destination for students and staff who need conflict resolution. The office is staffed by Ombudsman George Cole, assistant Ombudsman Barb Carswell and Ombudsman officer Carley Davidson. Cole thinks it’s important that Algonquin students are made aware of the service. “If I’m a student at an institution of this size, where we have a large number of students and a broad spectrum of learners, it is inevitable that we will have conflicts, misunderstandings and disputes,” Cole said. “ A student may not be happy with something that happened in a classroom, that happened with a friend or something about a policy. The office of the Ombudsman deals with a whole range of conflicts and not just issues between the college and students. In some cases , the office deals with conflicts between individual students and student groups. No matter what, Cole says the office’s main goal is to stay impartial while still resolving the issue. Cole gave an example of an issue that had occurred recently where two students were being charged with plagiarism. One had taken another’s work and was claiming it as their own. Neither would budge so after going through the faculty involved, the issue was brought before the office of the Ombudsman. The anecdote ended with one of the students confessing and having to write a letter of apology to the other. 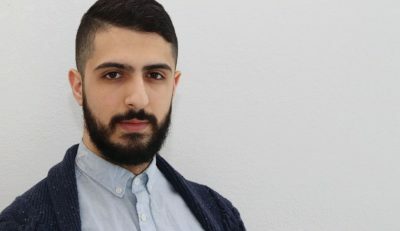 “This is just one of the examples of people sometimes being able to disclose things because it is a confidential space,” said Cole of the story. In some cases, the office of the Ombudsman can offer students retroactive accommodations. For example, if a student has a medical emergency or condition that affects their ability to do their school work over a certain period of time they may allow the student to re-do that period of their academic career. This accommodation is not limitless; an alumni of the college could not come back and try to claim retroactive accommodations for something that affected them during their time at the college. The number of complaints and concerns dealt with by the office of the Ombudsman has been increasing over the past four years. In the 2013-14 school year that number was 794. In 2016-17 it rose to 1152. “It’s a natural reflection of an increase of the student population, with more students comes more potential for concerns. That’s one reason, I think another reason is the awareness of the office,” Cole said. The types of concerns are sorted into six categories: academic, services, human rights/ student rights, other, non-academic student conduct and Algonquin students association. Across all years on file the academic category has had the most complaints. 2016-17 had a total of 845 which makes up 73 per cent of the concerns for the year. The definition of the ‘other’ category of concerns is ambiguous but according to Cole it covers conflicts that are indefinable by the other five categories. “If it’s an issue involving the registrar’s office, if it’s with parking services or if it’s with residence, all of those we group them in other section,” said Cole. Naturally the number of files opened has also increased. Each file opened represents a student or staff member who has come to the office of the Ombudsman with a concern or complaint. The number of files opened is not the same as the number of complaints: there can be multiple different complaints in one file. The annual statistics show a slight increase over the past seven years. In 2011-12 there were 441 files opened and over the next five years that number grew to 485 in 2016-17. Cole believes the reason for the higher number of files opened at the school has to do with the increase in student population as well as more awareness of the office. The office tracks the number of files opened per month. The most recent year on file, 2016-17, shows December as the month with the highest number of files opened, with a total of 63. Most of the years on file show the winter months as having the most files opened. For 2013-14 it was November, but for 2015-16 it was January. 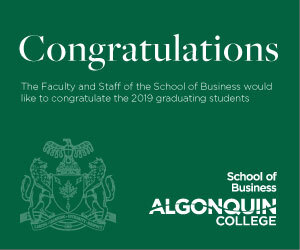 The number of files opened concerning each academic department at Algonquin are also included in the annual reports. For 2016-17 the school of health and community studies had the most with a total of 93 the department with the least amount was the Career and academic Acess Centre with 0. This does not mean the school of health and community studies has the highest number of complaints. An open file can represent a single complaint or many. Cole says it is typical to see departments that have a high level of internships and co-ops have a high number of files opened. This brings more people into contact with students which increases the chance for concerns to be raised. “In the report we caution against the notion of viewing a department with an increased number of files opened as a problematic department,” said Cole. “Part of the reason is the school of health and community studies has a lot of labs, clinicals and internships. They have a number of programs that have external stakeholders so that increases the number of people involved. It’s not only the college you have people outside the school involved.” Cole also said another reason that the school of health and community studies has an increased number of cases is that they have more programs which means more students. The annual reports are open to the public. They can be found on the Algonquin Ombudsman website. Who you gonna call? Have you heard of the Ombudsman? Reviewed by Connor Wilkie on December 7, 2018 .